This antibody detects endogenous levels of total EZH1 protein. Synthetic peptide (Human) from an internal region of EZH1. WB: Extracts from HT-29 cells, LOVO cells, A549 cells, NIH-3T3 cells, RAW264.7 cells and COS-7 cells. IHC-P: human brain tissue. Our Abpromise guarantee covers the use of ab64850 in the following tested applications. WB 1/500 - 1/1000. Detects a band of approximately 85 kDa (predicted molecular weight: 85 kDa). Polycomb group (PcG) protein. Catalytic subunit of the PRC2/EED-EZH1 complex, which methylates 'Lys-27' of histone H3, leading to transcriptional repression of the affected target gene. Able to mono-, di- and trimethylate 'Lys-27' of histone H3 to form H3K27me1, H3K27me2 and H3K27me3, respectively. Required for embryonic stem cell derivation and self-renewal, suggesting that it is involved in safeguarding embryonic stem cell identity. Compared to EZH1-containing complexes, it is less abundant in embryonic stem cells, has weak methyltransferase activity and plays a less critical role in forming H3K27me3, which is required for embryonic stem cell identity and proper differentiation. Belongs to the histone-lysine methyltransferase family. EZ subfamily. Nucleus. Colocalizes with trimethylated 'Lys-27' of histone H3. Ab64850 (1/50 dilution) staining EZH1 in paraffin embedded human brain tissue by immunohistochemistry. The left panel is in the absence of blocking peptide, whereas the right panel is in the presence of blocking peptide. Publishing research using ab64850? Please let us know so that we can cite the reference in this datasheet. Do you have any Ezh1 antibody that works well on mouse tissue? Please let me know if you need any additional information or assistance. black after 1 s exposure time. developed the film after washing steps. 5% milk (WB is attached). Is there any other blocking solution I can use? should work based on literature. Let me know what you think. Thank you for sending the image of your blots. When you use the PVDF membrane, are you pre-wetting it with methanol? Because PVDF is hydrophobic, it may not properly bind the blocking agent without the pre-wetting step. This could potentially cause the black blot you are seeing. 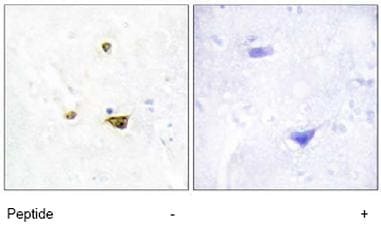 The speckled signal observed with the donkey anti-rabbit HRP secondary and 5% donkey serum blocking agent is typically a product of contamination in the blocking buffer or primary antibody diluent. This may be prevented by either filtering your reagents or using fresh buffers. This could also bea result of contamination on the sponge in your transfer apparatus. Thoroughly washing the transfer equipment should prevent this. This EZH1 antibody is validated using 5% BSA in TBST as a blocking agent, but it should be suitable for use with milk and donkey serum as well. Because the signal observed is so strong, I would recommend using a much higher dilution of secondary antibody (at least 1:50k - 1:100k). Increasing the blocking time to overnight at 4C may also help. If you are looking to try an alternative blocking agent, gelatin is sometimes used. There are also several commercial blocking agents available (including ab126587 and ab64234), however these tend to be casein based. Because casein is the major protein in milk, they may or may not produce different results in your experiment. My WB membrane is completely black using ab64850. Thank you for your phone call. As we discussed, it is possible that your 6 x 15 minute washes are washing the blocking agent off your membrane. It may help to reduce the wash time to 3 x 5 min, shorten the primary antibody incubation to 1 hour at RT, and use less primary antibody. I hope this will help to improve your results, if not, please let me know and I will be happy to help you further. I intend to buy the antibody detecting Ezh1 suitable for immunohistochemistry (ab64850). 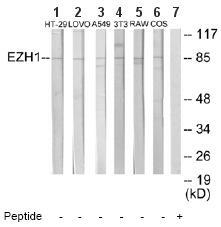 Do you know if this antibody detects Ezh1 exclusively? Or rather both Ezh1 and Ezh2? Thank you for contacting us. We do not have tests against purified Ezh1 or Ezh2 but a BLAST search of the immunogen sequence returns only Ezh1, so it is expected that the antibody is not capable of detecting Ezh2. I hope this information is helpful to you. Please do not hesitate to contact us if you need any more advice or information.